As you may know, today, June 5, is Barricade Day. I’m sure that many of us will watch Les Miserables and cry accordingly. If you’re still in the mood for commemorating a historical event with a long, epic movie featuring amazing characters… why not watch The Longest Day tomorrow? Made in 1962, The Longest Day covers (almost) every aspect of June 6, 1944, better known as D-Day–or Operation Overlord, or the Allied invasion of Normandy, depending on how descriptive you want to get. Here’s 6 reasons why you should watch The Longest Day this June 6. 1. All the actors speak in the language of the character they’re playing. German officers discussing an intercepted code. They’re talking in German. The German officers speak in German, the French resistance speak in French, and the British and Americans speak with their own accents and dialects of English. The German and French parts are subtitled in English, but–here’s the best part–not all of them are subtitled. Simple phrases like “yes” and “no” aren’t translated after the first few times, and some cognates aren’t translated either. I think this was a brilliant move on the director’s part. It keeps the viewer more engaged, and it makes us feel like we’re right there in 1944. The entire film is breathtakingly accurate. You will learn SO much about D-Day. Almost every aspect of the invasion is covered, from the naval bombardment to the landing at Pointe du Hoc to the paratroopers’ drop zones. After watching this film, I didn’t have to study D-Day for my history exam, because I knew it so well. You’ll learn all sorts of cool nuggets of information, about the people and tactics on both sides of the conflict. Basically, you’ll be an expert on the invasion of Normandy if you watch The Longest Day. 3. It’s not just a parade of facts. The film includes character arcs that you can follow throughout the invasion. If you’re like me, you like history more for the stories and people than the strategies and details. There’s nothing wrong with memorizing every weapon used at D-Day, if you think that’s cool, but it’s not my cup of tea. The Longest Day does a good job of accommodating both types of history lovers by adding character-driven plot threads that pop up every now and then during the narrative. From an awesome lady in the French Resistance, to a lovable American private, to this salty German fighter pilot (below), there are plenty of recurring characters who will make you smile every time they show up. It’s like running into an old friend. 4. Also, so many cool people in the cast. Richard Burton (a sardonic RAF flight officer). Sean Connery (the lovable private). Henry Fonda (Teddy Roosevelt Jr). Paul Anka, to name a few. 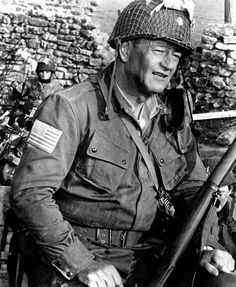 And, oh yeah, freaking JOHN WAYNE. 5. Well-timed moments of humor keep you afloat. “Who wants to watch a whole movie about war?” one might say. “That’s too sad!” In The Longest Day, the directors intersperse bits of humor throughout the story of D-Day. They let you in on the soldier’s jokes. They show you a bagpiper on the beach, reviving the Scottish soldiers’ patriotism. A French villager tries to give the invading soldiers champagne that he has saved for them. These small moments don’t take away from the seriousness of D-Day, but they keep the viewer from feeling completely bogged down for the whole film. 6. It’s important that we remember those at D-Day who gave their lives to stop Hitler. Every person at D-Day, from Eisenhower to Lt. Col. Vandervoort to a 17-year-old landing at Omaha Beach, played a crucial role in stopping Hitler and his twisted Third Reich. We all owe a huge debt to them, and each one deserves to be remembered. We may not be able to go down a list and commemorate every single person involved in the invasion. But we can watch The Longest Day, following the stories of Flying Officer Campbell and Private Flanagan, beginning to grasp the sacrifice that thousands of men just like them made for us. That’s the beauty of stories combined with history. What do you think? How are you commemorating D-Day? What other World War II movies should I watch? Let me know in comments! Featured image. All gifs from the film made by me.